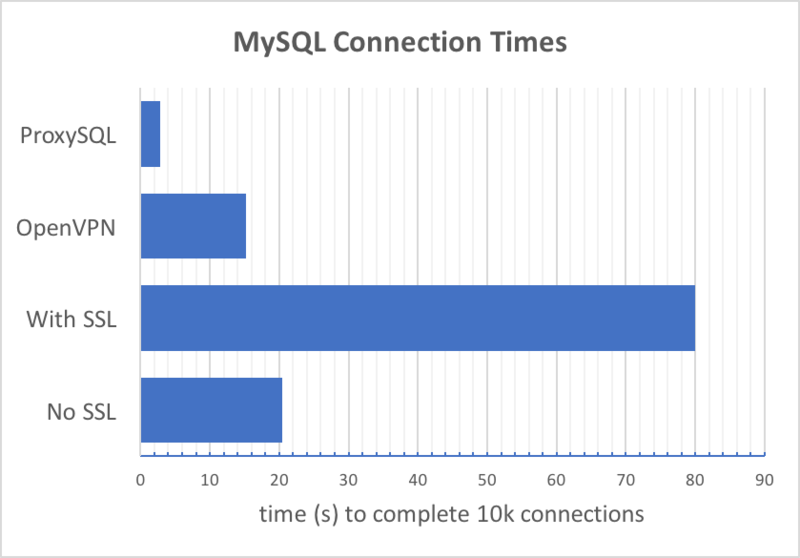 This article takes a look at how ProxySQL improves MySQL SSL connection performance, and how you can implement this method yourself. 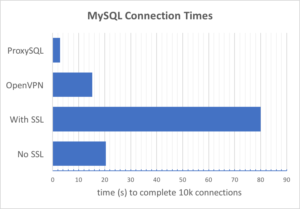 In this blog post, we'll look at how ProxySQL improves MySQL SSL connection performance. When deploying MySQL with SSL, the main concern is that the initial handshake causes significant overhead if you are not using connection pools (mysqlnd-mux with PHP, mysql.connector.pooling in Python, etc.). Closing and making new connections over and over can greatly impact on your total query response time. A customer and colleague recently educated me that although you can improve SSL encryption/decryption performance with the AES-NI hardware extension on modern Intel processors, the actual overhead when creating SSL connections comes from the handshake when multiple roundtrips between the server and client are needed. With this setup, ProxySQL is running on the same server as the application and is connected to MySQL though local socket. MySQL data does not need to go through the TCP stream unsecured. As you can see, the difference between SSL and no SSL performance overhead is about 400% - pretty bad for some workloads. Connections through OpenVPN are also better than MySQL without SSL. While this is interesting, the OpenVPN server needs to be deployed on another server, separate from the MySQL server and application. This approach allows the application servers and MySQL servers (including replica/cluster nodes) to communicate on the same secured network, but creates a single point of failure. Alternatively, deploying OpenVPN on the MySQL server means if you have an additional high availability layer in place and it gets quite complicated when a new master is promoted. In short, OpenVPN adds many additional moving parts. The beauty with ProxySQL is that you can just run it from all application servers and it works fine if you simply point it to a VIP that directs it to the correct MySQL server (master), or use the replication group feature to identify the authoritative master. Lastly, it is important to note that these tests were done on CentOS 7.3 with OpenSSL 1.0.1e, Percona Server for MySQL 5.7.19, ProxySQL 1.4.1, PHP 5.4 and OpenVPN 2.4.3. ProxySQL Admin Interface Is Not Your Typical MySQL Server! ProxySQL Rules: Do I Have Too Many? Published at DZone with permission of Jervin Real , DZone MVB. See the original article here.